"The look of awe - even disbelief - in students' eyes as they made their way through the crowd of 'Dads' was astonishing." Hundreds attend "Breakfast with Dads" at Billy Earl Dade Middle School in Dallas on Dec. 14. 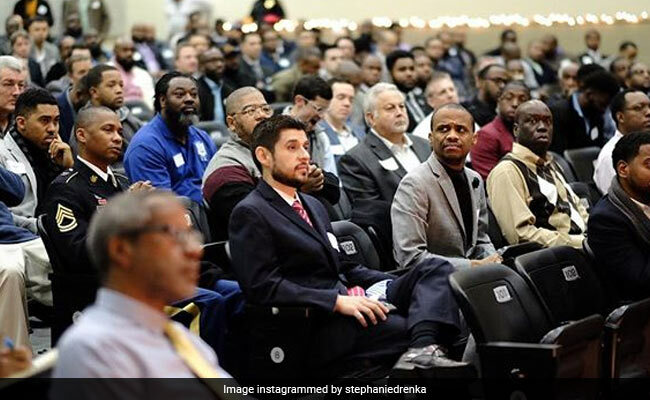 The school - with a student population of nearly 900, about 90 percent from low-income families - planned to host its first "Breakfast with Dads," according to the Dallas Morning News. About 150 male students, ages 11 to 13, signed up. But event organizers were concerned that some would attend without a male figure at their side, so they put out a call for volunteers who could serve as mentors. "When a young person sees someone other than their teacher take interest in them, it inspires them. That's what we want to see happen," the Rev. Donald Parish Jr., pastor of True Lee Missionary Baptist Church and the event organizer, told the Morning News. "Dade MS needs Males! Please share and text 214-284-1589 to confirm your participation and receive more info!" she tweeted. "I will never forget witnessing the young students surrounded by supportive community members. There were so many volunteers, that at times I saw young men huddled in the center of 4-5 mentors. The look of awe - even disbelief- in students' eyes as they made their way through the crowd of 'Dads' was astonishing. "Jamil 'The Tie Man' Tucker led the auditorium in a hands-on icebreaker activity. He spoke of learning how to tie a tie as a rite of passage some young men never experience. Mentors handed out ties to the eager students and helped them perfect their half-Windsor knot. "The sight of a necktie may forever bring a tear to my eye."